The ABMI takes land access seriously: without the cooperation of private landowners, biodiversity monitoring would not be possible. All reasonable effort is made to ensure landowners are fully aware of the ABMI’s monitoring activities and that they feel comfortable with ABMI field technicians visiting their property. Every winter, land access coordinators contact landowners to introduce themselves and explain why the ABMI wants access to their land (see below for a description of what the ABMI measures at each location). From January to April, the coordinators travel throughout the province to meet landowners in person to discuss access rules and requests. These could include areas of the property to avoid walking on, suggestions about trails to drive on, or requests to have survey crews call the landowner when they are leaving the property. Prior to the beginning of the spring field season, with site-specific information packages, the coordinator communicates these access requests to the ABMI field technicians to ensure they’re implemented. And finally, a week prior to the ABMI’s arrival on their land, the access coordinator calls landowners again to remind them of the ABMI’s visit. The ABMI recognizes that not every Albertan owns property; however, the public has a stake in the majority of the province’s land. “Over half of our province is crown land, owned by the public,” says Brandi. “It’s our responsibility as Albertans to know what we have living on our land and to pay attention to how it’s changing.” The ABMI’s public database gives all residents the opportunity to observe potential changes in the province’s landscape and look up information on species they’re interested in. At each location, the ABMI monitors a terrestrial site and a nearby wetland. Wetland sites: Wetland sites are assessed in May to determine the best point of access and to verify the water body meets the ABMI’s specifications (e.g. must be at least 1 metre deep). Crews return to sites in late June and July to perform surveys, which includes shoreline vegetation mapping and identification, collecting water samples to measure nutrient levels and pH, and sampling of freshwater invertebrates. Terrestrial sites: Site establishment occurs in May, when crews set-up a complex grid of flagging tape in a one-hectare area. Spring protocols are performed in late May or early June and include a breeding bird survey, as well as data collection on habitat characteristics such as elevation, slope, and ecosite definition. A third visit takes place in late June or July to perform summer protocols, which includes soil sampling, tree aging, canopy cover measurement, and a bryophyte (moss) and lichen survey. Photo: (c) Brandi Mogge. 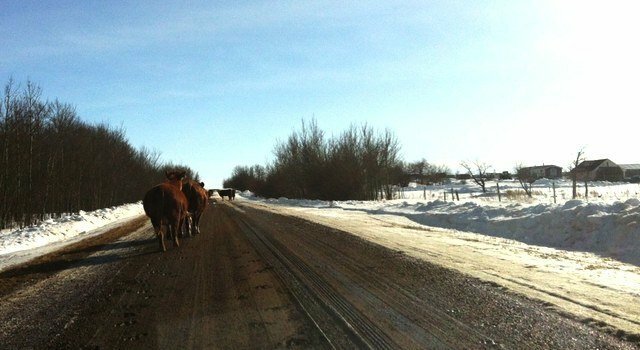 Photo caption: Cows on roadway on recent land access trip.